Don’t Let Winter Keep You Inside, Go Hike! A 2014 REI survey shows that two in five Americans are outdoor enthusiasts and that 73 percent of those outdoor enthusiasts want to spend even more time outside in 2015. That means hikers and outdoor adventurers will be venturing out during the wintertime. But, before you go, here’s what you need to know. It’s really important for winter hikers to dress for safety and comfort while out on the trail. Experienced hikers often cite packing multiple layers and a hat as the two most important rules to follow when packing clothing. And, dressing in layers is not just for cold weather but for warm weather, too. This is an important rule to follow because it can keep you warm at night or in the morning and also let you remove layers to enable respiration to evaporate, which helps you stay dry. Winter hikers should avoid wearing cotton clothing—including socks. This material retains and absorbs water, which leaves you cold and wet. Instead of cotton, wear wool or synthetic materials. Both of these fabrics wick moisture away from the skin, and wool fabrics are suitable for winter because they retain heat. Additionally, having proper footwear is essential. Hikers should wear a pair of breathable, waterproof boots with built-in safety-toe protection to keep their feet warm, comfortable and dry. Brands available at Cabela’s such as Danner and Keen are great options. Hikers that trek through high-altitudes are exposed to high-levels of UV rays because the thinner atmosphere doesn’t block as many of the rays as the atmosphere in lower elevations. This can result in severe sunburn. The University of Texas reports that snow bounces 80 percent of the sun’s reflection; which can be compared to a day at the beach. Portable sunscreens like brushes and sticks, lip balm and a pair of sunglasses should always be on hand. Keeping your backpack and its contents dry is really important. Hikers should put items like electronics and clothing in plastic bags for a second layer of protection and sleeping bags should be wrapped, especially if they are on an external frame pack. After all, a wet or damp sleeping bag is not very effective. Also, hikers should squeeze out all of the air in the plastic bags to ensure that no space inside of the pack is wasted. Multi-Purpose Tool: Having a compact multi-tool handy on the trail can help hikers fix broken gear, cut strips of clothing into bandages and even remove splinters. GPS: According to the Wilderness Medical Society, between 1992 and 2007, there were 78,488 people involved in 65,439 Search and Rescue (SAR) incidents. On average that’s 11.2 SAR incidents per day. Packing along a GPS device can tell hikers where they are and how long they have to go. Although maps may seem outdated, it’s important to pack them along as a back up. First-Aid Kit: Hikers should always bring a medical kit. And, as an extra precaution, outdoor enthusiasts should take a first-aid class to learn how to properly address injuries. 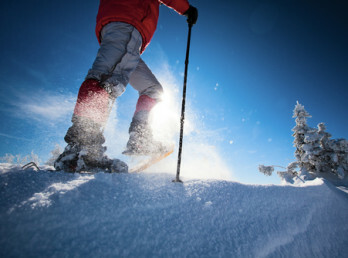 Extra Food: Winter hikes can be unpredictable. Hikers should always pack extra food like dehydrated items or MREs for day or multi-day excursions. A water purification system or iodine tablets should be included in a backpack as well. The American Hiking Society recommends keeping all drinking water warm (so it doesn’t freeze) by boiling it before pouring it into water bottles. Safety Items: Winter hikers should make sure they are prepared for shorter days during the winter. Including a headlamp, flashlight and extra batteries is a must for these hikes. Other must-pack safety items include a whistle and materials to ignite a fire. 0 Responses to "Don’t Let Winter Keep You Inside, Go Hike!"